Giving your dog the most comfortable place to sleep goes a long way in their overall health and longevity. The best memory foam dog beds provide you with just that. These are better than your regular dog beds because they use higher quality and thicker foam. In addition, the memory feature of these foams allows them to adjust to the shape of your pet’s body. This gives the more comfort as they use it, with the proper support so they don’t sink down over time. Here’s our top choices when it comes to this type of dog bed. Our list offers a variety of products that suit both small, medium and large breed dogs. Plus, we’ve only chosen those that are comfortable and won’t give way with use. You can click on this link to see the top rated memory foam dog beds on Amazon.com. Our reviews below are meant to help you get a better understanding of the products as well as what to look for in dog beds made with memory foam. Using research, we’ll help you find the products that will fit your dogs’ needs. And for that, you will have to look any further apart from the ones listed above in our top picks. This foam dog bed is available for small to large breeds. The product is available in 5 different sizes running from the smallest that’s 25 inches long by 20 inches wide. This goes up all the way to the biggest size at 55 inches by 38 inches. This orthopedic dog bed offers two layers of protective surfaces. Also, it comes along with a waterproof cover. This gives your pet a soft surface to lie on as well as an outer material that’s easier to maintain. The bed has suede zippered covers that come with rubber, non slip bottoms. The zipper makes it easy to remove come washing time. Due to its supporting foam layers, the bed is especially good for dogs with arthritis joint pain. This is because it is made completely of memory foam. Another plus is that you don’t have to worry about your dog or you being allergic to this dog bed either. The reason being that the memory foam and suede are non-allergenic. As with memory foam, the bed is designed to always keep its shape and will not flatten over time. This is another excellent option for pet owners who want to pamper their pooches. This sofa style bed is made with orthopedic memory foam. This makes it ideal for any aging dog or one with aches or pains from previous injury or arthritis. Although this foam bed would be great for any dog, it is especially useful for dogs that are older. It will comfort them and help them to get the rest that they need. This sofa style bed comes with soft rounded borders that are elevated. These can work as pillows or an edge that dogs like resting against. The memory foam is designed to be thick so that it will never “bottom out”. Also, it has a cover that is removable for washing. On this dog bed, the surface is super soft with velvety material designed for an unbelievable amount of comfort. Any fur baby is sure to love this memory foam dog bed. It comes with a 1 year warranty and there are 2 sizes available, small (33 inches by 24 inches) and large (41 inches by 30 inches). 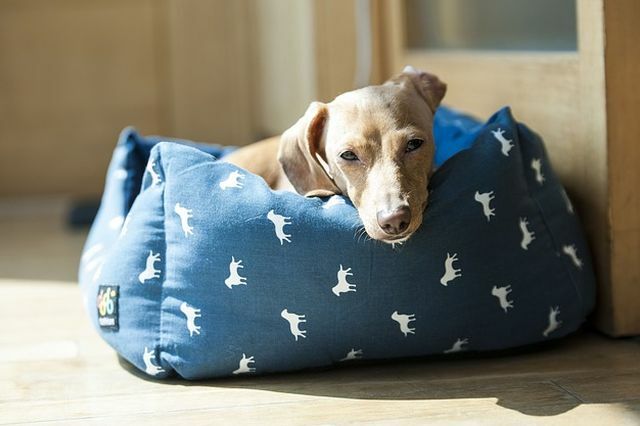 Available in small, large and extra large sizes, this memory foam bed is a great choice if your pooch likes to feel cozy and rest against soft objects. Small: measures 25 inches by 20 inches; made to easily hold 50+ pounds in weight. Large: measures 36 inches by 28 inches; easily holds a 100+ pound dog. Extra Large: measures 44 inches by 34 inches; for dogs weighing 150+ lbs. This is an ideal pick for any pet owner seeking a dog lounge or bed for their furry friend. This foam bed is sure to leave you satisfied! It has a lot of great features including its smart design. It also comes with a sturdy base and bolsters that provide optimal support and comfort. Also included is the a water resistant and anti-tear cover. This bed comes equipped with a non-skid bottom and blends in seamlessly with your decor. Also, it’s worth mentioning that you get the benefit of it being easy to clean. This is due to the removable cover that is machine washable. The material also makes it simple to spot clean and remove hair. If you have a large dog or several small dogs, this bed would be great for you. This product is designed for medium to extra large dogs. It is a good option if you are seeking a luxuriously comfortable foam bed for your large dog or several small dogs. For whatever purpose you need it for, this item will definitely serve its purpose well. There is no doubt that all dog owners and pets will be happy with this purchase, as it is compiled with many great features. This foam dog bed is designed to be long lasting. So, once you make the purchase, you won’t have to worry about getting a new one for a very long time, if at all. It has two excellent layers of fabric covers and comes with twelve durable jean denim fabric zipper covers to help secure the pad. Along with this, some of the other features include the superior high density memory foam that never loses its shape. The foam bedding also offers the pet a great benefit in relieving the pain of arthritis or those from joint or muscle pain. All furry friends are sure to love this foam bed. It is available in 5 different designs. And you can choose from 7 sizes ranging from the smallest at 35 inches by 20 inches, all the way to the largest at 55 inches by 47 inches.